Across my Facebook feed came a meme (which I won’t repost here) suggesting that the only reason we haven’t outlawed Nazis and Nazi rhetoric in the United States is because we celebrate their beliefs. This line of thinking really unsettled me. Not because I celebrate Nazis or their ilk. Not because I support white supremacists and their vitriol. Not because I want to live in a world where Nazi sympathizers have power. No, I’m unsettled by some of what I’m hearing among my kind-hearted and social-justice minded friends. Honestly, I’m as repulsed by this vile message as you are. But … the First Amendment. Our bedrock values of freedom. It’s still there, and we need to remember that the truest test of our belief in free speech comes when we are asked to defend the right of our brethren to espouse beliefs that we find most repulsive. There is a fine line between speech that offends and speech that incites violence. Our courts have a difficult time drawing that line, and they don’t always get it right. But we will be judged by how we legislate or enforce the expression of beliefs that we find most reprehensible, and right now, I fear some of us are losing sight of that. 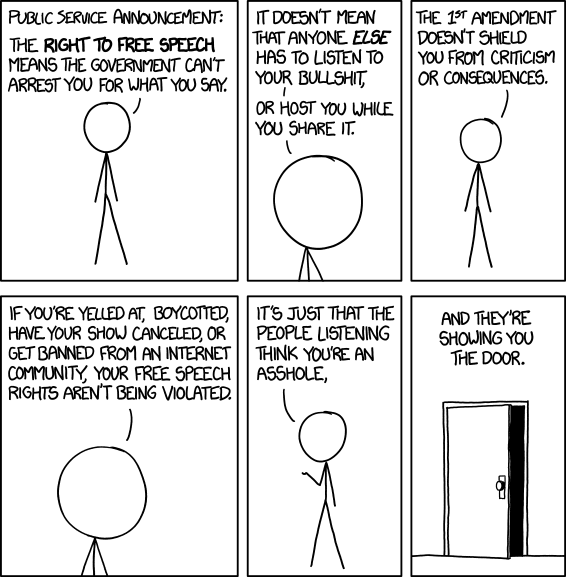 Yet, as the XKCD cartoon above so clearly points out, it is your right as an American citizen to react to speech you find offensive by speaking back. The First Amendment protects against government intervention, not individual reactions. Many states allow employers to fire employees for any reason, including your actions and speech outside of work. That’s OK, unless you work for the government (or use government resources or reputation to express yourself). I can shout back at you. I can counter-protest. I can boycott your business. I cannot pass a law restricting you, though. I get that the recent surge in white supremacist rhetoric has us all feeling horrified and disgusted. We thought we were beyond this. But we must not conflate disgust with the impulse to restrict what others can say. Period. Previous ArticleWhat does a full heart make you do?